Cheikhou Kouyate and Mauro Zarate took advantage of a lethargic Arsenal to kick their season off on winning terms and shock the masses at the Emirates. An error by Petr Cech on the stroke of half-time gifted a goal to change the complexion of the match, as Kouyate headed in from a free-kick. Soon after, all of Arsenal's defence were caught of guard when Zarate drilled it low from 30 yards for the second. Wenger's side struggled to mount a comeback and with boos ringing around the Emirates post-match, they knew there was a big mountain to climb to fulfil high expectations. A great noise accompanied the sounding of Martin Atkinson's whistle as Arsenal got the action going, with means to finally get their hands back on the title when all is said and done. Aaron Ramsey looked to instantly create a chance but instead gave the Hammers an early goal-kick. In turn, that prompted a solid period of play from the visitors, as Kouyate's cross was cut out by Mertesacker, while they reduced any attempts from the Gunners to overwhelm them. When Arsenal did look to embrace their silky play—which ripped the same opponents apart back in March—the tactics from Slaven Bilić's men seemed clear: to foul them. Mark Noble first hacked down Francis Coquelin after a slip, before Angelo Ogbonna couldn't deal with the ferocious pace of Oxlade-Chamberlain, taking him down en route for a loose ball. Situated in dangerous territory, Mesut Özil could find nothing other than he wall with the subsequent free-kick. Arsene Wenger's men had every intention of utilising their fluent passing to find a breakthrough, but in the middle, the Hammers had plenty of time on the ball and plenty of space to run, exemplified when Sakho surged through the middle before the threat was fizzled out by Mertesacker. 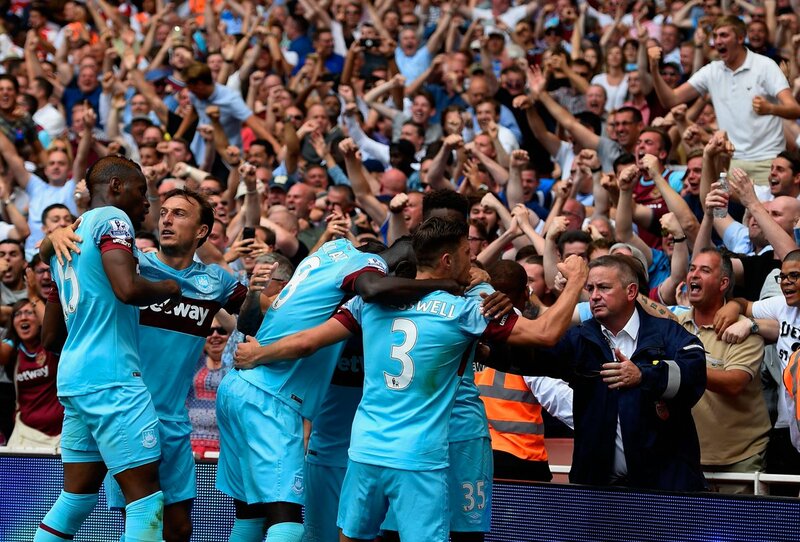 For more than twenty minutes, the North Londoners remained conserved while West Ham held their own. Eventually, they would bulk up on the numbers going forward; but were just a pass shy of really posing a threat to goal. Olivier Giroud controlled a cross on the chest but saw his subsequent volley ricochet of Ogbonna's boot. Slowly but surely, there were indications that Wenger's side were revving up and getting ever so close to gaining the all important initiative in the match. A drive from the Ox eventally ended with the ball coming out to Santi Cazorla, whose acrobatic attempt at goal from full stretch ended up on the roof of the net. Soon after, a dipping volley from Aaron Ramsey took a deflection which was saved with some great reflexes by Adrian. By this stage, the writing was beginning to accumulate on the wall; as the prospect of an Arsenal goal edged towards inevitability. Oxlade-Chamberlain's cross was cleared, and Mertesacker's header was fumbled by Adrian before the keeper scurried to clutch on to it. Dimitri Payet's run and eventual chip which was deflected over Cech's crossbar was a stern indication that Arsenal shouldn't get comfortable. Back on the other end, West Ham remained firm, as Ramsey's shot drifted wide and Cazorla's ball was cut out. But then came the dagger. A winding blow at the stroke of half time, as a counter-attack from the Hammers changed the entire complexion of the game. With a free-kick incoming, Petr Cech darted off his line to punch the ball out, but Cheikhou Kouyate got their first, and headed into an open net to dampen spirits for the home fans at the interval. Frustration was evident and not just from the face of Wenger who appeared tired to the recycled prospect of Arsenal not living up to expectations, but from the misplaced passes. 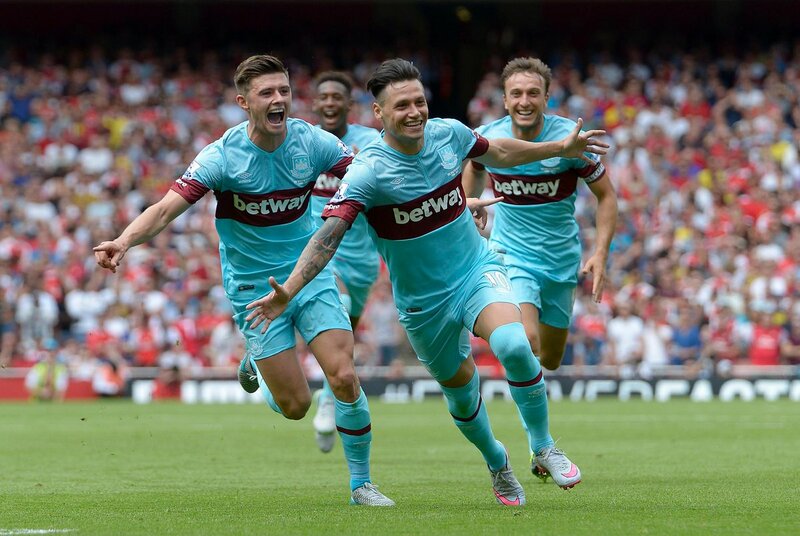 That also made way for Zarate to burst free and get into the Arsenal box, but he was just about halted. Once again adding to his marvellous debut was Dimitri Payet who used some stunning footwork to bamboozle the Arsenal defence, but that's all it would do. Giroud's chances increased, but none came into fruition—and things would worsen when the Frenchman's side conceded another goal, quite literally out of nowhere. With no defenders really venturing outside the box to take out the ball, Zarate was in plenty of space, turning and unleashing a low shot to the bottom-left corner, catching Petr Cech with surprise and the whole Emirates as the lead was doubled. 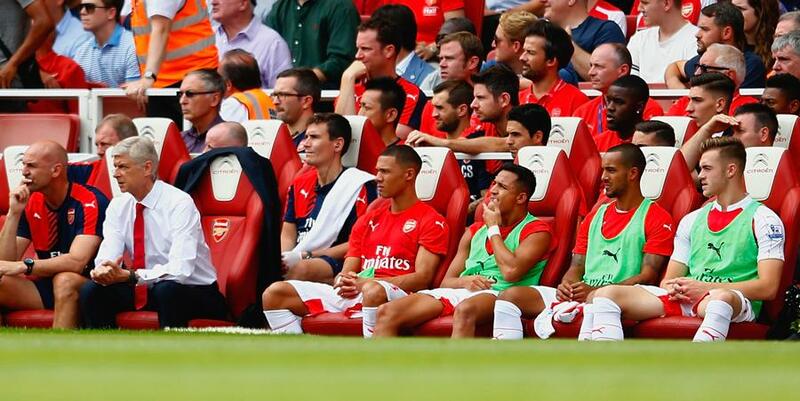 Even with Sanchez on, Arsenal seemed uninspired and lethargic. West Ham were the ones enjoying themselves, passing it around their opponents at ease; and at times shaking of the nerves to clear after Walcott got in the way. Alexis' shot into the side netting showed exactly why he didn't start, and was a reflection on the poor performance of the Gunners. There was soon some cause for concern when Giroud and Tomkins clashed heads before they both crashed to the ground. As the medics did their thing, they were back up eventually to the relief of all spectators. Desperation increased, Chamberlain's shot was off, Ozil fouled Noble and Sakho was let loose, but the fearing outcome of a loss became more prominent by each passing minute. They lacked the spark throughout, West Ham deserved the win and the boos at the Emirates makes it a mountain to climb to fulfil their expectations judging from this loss. 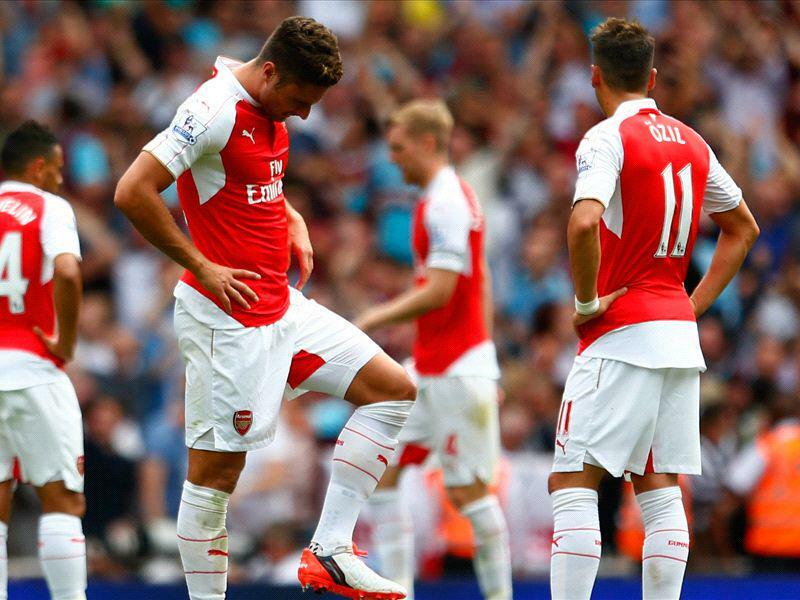 Petr Cech's errors cost Arsenal as West Ham United defeat them 2-0 at the Emirates on opening weekend.